Every year, during the Vinitaly wine fair that takes place in Verona, MASI – a leading Amarone producer from Veneto – organizes a special dinner for its International partners. 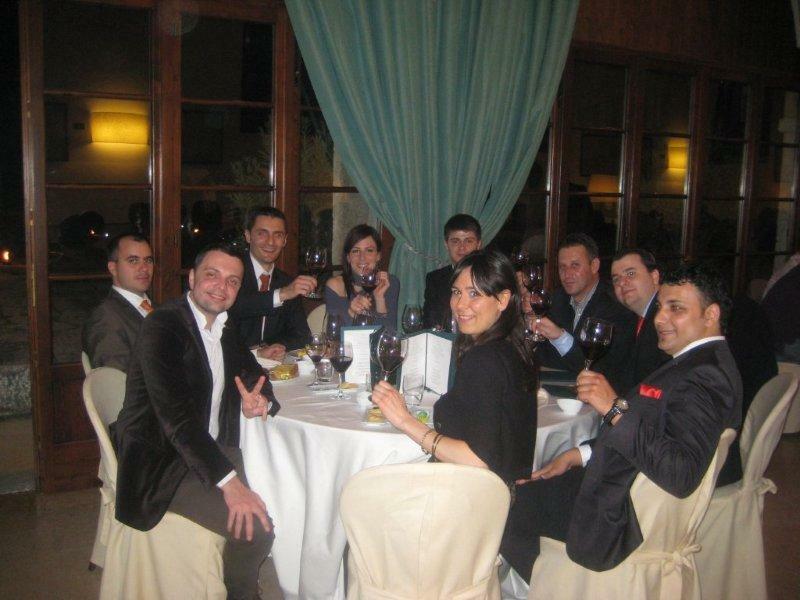 For 2011, the event was organized at the villa on the Serego Alighieri estate. It is here that Dante Alighieri spent several years of his exile in Verona. His son, Pietro, purchased the Casal dei Ronchi in Gargagnago, in the heart of the historic Valpolicella region in 1353. The estate and the house have been in the possession of Dante’s descendants for twenty generations. Today the premises are surrounded by Valpolicella vineyards. Masi has been collaborating with Count Pieralvise for more than thirty years, both in the production and distribution of products from the Verona estate. I was one of the members of a group of seven that came from Romania for this special occasion and also to attend this year’s Vinitaly wine fair. Together with Ionut Trandafir – brand manager for Recas winery and their sommelier – Alexandru Dan, Bogdan Cojocaru – Food and Beverages manager for Intercontinental Hotel, Octavian Stoica – F&B manager for Crowne Plaza, Razvan Aflorei – sommelier at Alpin Hotel in Poiana Brasov and Razvan Papuc – the representative of a beverage distributor from Brasov, we all attended this fancy dinner organized by Masi. The main theme of the dinners organized each year by Masi, is to showcase the versatility of the Amarone wines matching a wide range of International cuisines. Compared to Marco Polo that left from Venice to explore new worlds, having its own personality, Amarone wines, due to their typicality and intensity, are able to perfectly match food dishes from Americas, China, India and many other regions. This year’s choice was the cuisine from Lombardy. 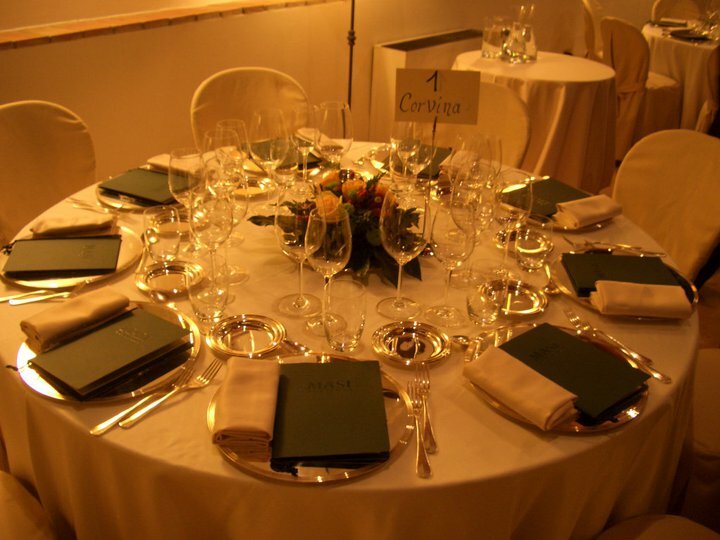 The food was prepared by “da Vittorio” – a three Michelin star restaurant in Bergamo. As the reception was scheduled to start at 8 pm, our group arrived at the villa a little earlier in order to visit the premises of this beautiful estate before dinner. 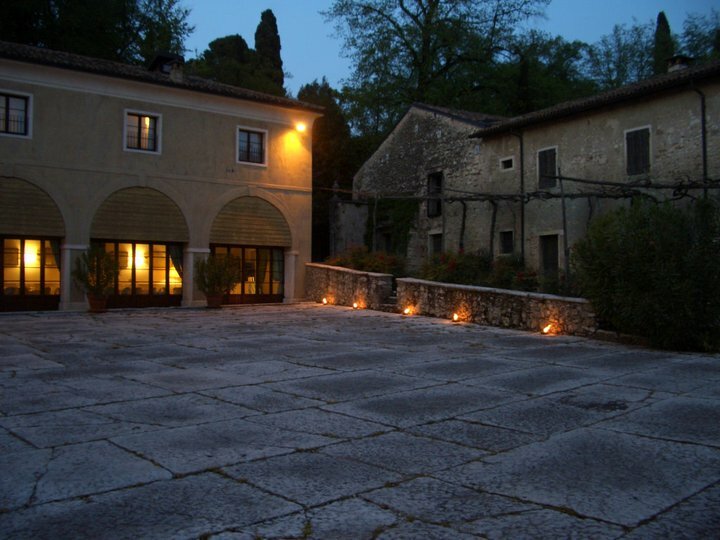 The reception started in the interior courtyard nicely lighted by candles, where guests were served a sparkling – Spumante Brut Millesimato 2007 – and a white still wine – Possessioni Bianco 2010. The wines were very well matched by a wide variety of finger food. On a special corner, different varieties of cheese were available for sampling and, to my shame, I did not manage to get nor the names, nor pictures with the stand. They were too delicious to taste and by the time I wanted to take pictures the dinner started. 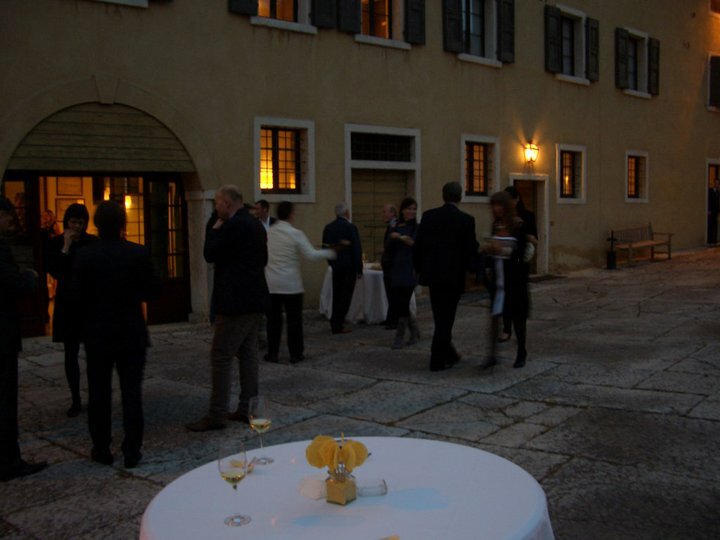 After brief introductions and socializing with some other guests in the courtyard, we were all invited to take our places in the main room were the dinner was about to begin. The dishes were simple but rich and tasty and they went very well with the rest of the red wines we had. 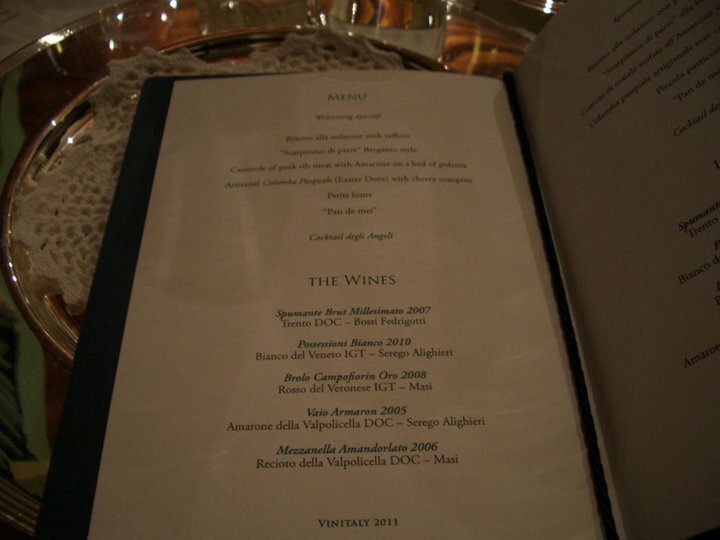 The wine of the night for me from the wines available on the menu was the 2005 Vaio Armaron Serego Alighieri. The dessert was accompanied by a Recioto della Valpolicella Mezzanella Amandorlato 2006 – a sweet wine with intense aromas of almonds and black fruit liquor on the nose, round and balanced in the mouth with a minty sweet finish. There was a great opportunity for me to sample the new released vintages from Masi and the new Serego Alighieri Vaio Armaron, understand more about their concept and at the end of the day have a lovely evening with good food and great wines. Two ladies from Masi that kindly answered all my questions about the technology, their range of wines, older vintages and future plans of the company sat at our table. I expressed my curiosity during our conversation to try 15+ years old Amarone wines and this could be arranged. One can request older vintages and bigger bottle formats that can be brought to Romania by the importer – Recas winery. A vertical tasting of 15-40 years old Amarone’s would be very interesting to try. This may become the theme of a future event organized by the International Wine Round Table group. More pictures from this dinner at the Serego Alighieri estate are available here.